I’m having a mini freakout right now. I feel like I keep eagerly reviewing candies new to market, only to be faced with panning most of them. Why? Is it that companies shouldn’t be creating new product, or is that they need to be making whatever they do end up making better? I don’t want to come off as pithy, cause I’m not-I truly do get excited at the prospect at new candy, especially new candy that’s totally in my wheelhouse-like new Tropical Chewy Lemonheads & Friends. I love Lemonheads. I love Grapeheads. I love Orangeheads. Appleheads and Cherryheads rank just a bit lower for me, but they’re solid. Then there’s Chewy Lemonheads & Friends. Love them too. Sour and sweet like the originak flavors, but way softer in the middle. And now there’s Tropicals. Personally, I find it really easy to love combinations like this in real life, ’cause real fruit has a ton of flavor. In the candy world, this has never worked for me. The candy flavors just don’t taste distinct and tangy enough to duplicate the experience you get with even mediocre real fruit. And in the case of Tropic Heads, the candy has done something that NO other Lemonheads family candy has. They abandoned the sour thing. Totally. They’re not even tangy, nothing. Which means they’re sweet. Sweet & out. And these 2 flavor combos all end up tasting confusing and insipid. I don’t want to go over all of them, but seriously-Pink Lemonade & ….Lemonade? Berry Banana came close to getting spit out. Just not good at all. I think all lasting brands probably have a stinker. Coke had New Coke. Ford had the Edsel. Garth Brooks had his “Chris Gaines” alter-ego phase. So whatever, no big whoop, we’ll just give Ferrara Pan a pass this time. But for you, friends, I say don’t buy em. Not unless you’re a 4 year old kid who can handle this kind of flat sweetness. Not for me. The only issue I’m battling is whether to give them a 1 or a 2. Not a good place to be. Wow. What a f-ing Sad Day. cuz I thought for sure these would get at least a 5. And so true – pink lemonade/lemonade flavor? Uberio Lamerio. 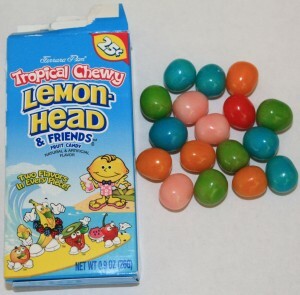 Yeah, this is a bummer – I saw the “Tropical Lemonheads” and started immediately thinking about which drugstore I’d be stopping at on my way home to pick that up. But, guess not. Oh I love me some chupa chups. And agreed – it’s like vanilla meets strawberry and you can taste them both. We should review some of those. They are by far the best Mexi candy.